Daoist breathing exercises are designed to activate the diaphragm muscle, expand the lungs, and invoke the body's innate relaxation response. There are four major types of breathing (调息tiao xi) used in Daoist practice. It is common knowledge that eating a healthy diet and exercising regularly is needed to have a healthy and strong body. Without exercise, the general condition of the body suffers. Without a healthy diet, we lack the calories and nutrients we need for physical and mental health. However, air is arguably more important that diet and exercise. Because we work hard to earn money to buy food (or work hard to grow food to eat), we have learned to value food. Air is free, and so it is easy to forget its importance, but we can go far longer without food and water than we can go without air. Breathing (along with digestion, sleeping patterns, and blood and lymph flow) is a part of the body's cyclic patterns, but is often overlooked and rarely practiced. Daoist breathing exercises are breathing practices designed to activate the diaphragm muscle, expand the lungs, and invoke the body's innate relaxation response. There are four major types of breathing (调息tiao xi) used in Daoist practice. These are natural breathing, reverse breathing, dantian breathing, and embryonic breathing. These breathing practices can be used on their own as a spiritual meditation practice, or used to compliment your martial arts training, allowing your to reach a deeper level of mental and physical health. Natural breathing describes the type of breathing that we typically use throughout the day. In this type of breathing, when you inhale, your diaphragm contracts and pulls downward, pushing the belly out, and the lungs expand. Exhalation is a passive act, so on the exhale, the diaphragm relaxes back up into a dome shape, air leaves the body, and the belly contracts inward. The breath should be slow (慢man), deep (深 shen), fine (细 xi), and even (均 jun). This allow your body to take in more oxygen and release more carbon dioxide. This leads to many health benefits: a lowering of blood pressure, slowing of heart rate, and faster elimination of toxins. Reverse breathing gets its name because it is, in many ways, the reverse of natural breathing. To try reverse breathing, inhale deeply, contract your abdomen and fill the upper part of your lungs. When you exhale, push your abdomen out, and drop your breath within the body. Because of the decrease of pressure in the lungs (increase of volume) the diaphragm will move down, so consequently, the organs in the abdomen will be contracted. Everyone has used this type of breathing, whether you are conscious of it or not. It is the way we instinctively breathe when pushing something heavy. The breath moves vertically, up and down within the body, like a pump. Interestingly, during reverse breathing, the breath also moves horizontally, moving backwards and forwards inside the belly during exhalation. 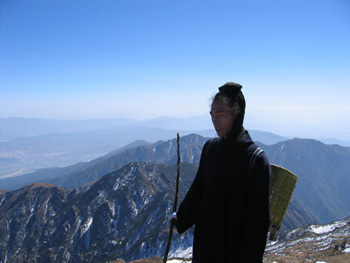 (A common Daoist technique is to imagine a pearl moving back and forth). I find reverse breathing a useful technique to use before meditation practice. It is important that you never let this become your natural way to breathe. Over-practice and incorrect practice of reverse breathing can lead to medical problems. I would not recommend anyone with high-blood pressure to practice reverse breathing. While I am not a medical professional, I was taught that exerting too much downward pressure on the lower abdomen can cause hemorrhoids, and too much upward pressure on the stomach can contribute to acid reflux problems. Techniques like moderating the amount of force used, and lifting up the pelvic floor can be used to prevent straining the breathing muscles, so is important that any advanced breathing techniques be learned and practiced under the supervision of an experienced teacher. The Chinese word "Dantian" literally means "cinnabar field". Cinnabar refers to mercury sulfide (朱砂 zhu sha) a toxic metal that early Daoists used to make medicine. "Dantian" is usually roughly translated as "elixir field" since the Chinese name means that it is a valuable energy center, a place where something valuable and medicinal can be cultivated. Although there are considered to be three major Dantian in the body. The Dantian we are talking about for Dantian breathing is the lower Dantian, a major energy center found slightly under and behind the navel. Dantian breathing describes when the lower back is incorporated into deep breathing breathing practice. For this type of breathing, the mind focuses on the Dantian and the chest stays relaxed, while the abdomen and lower back expand on the exhale, and contract on the exhale. There is a very important acupuncture point on the lower spine called the "Gate of Life" (命门 ming men) which can be stimulated by Dantian breathing, as can the kidneys. Daoist medicine tells us that when the kidneys are stimulated, your entire body's vitality and energy level will improve. Embryonic breathing is sometimes called "stopping the breath" (闭气). But it is important to differentiate that "stopping the breath" actually does not mean the same thing as "holding the breath". There are several Daoist practices that involve holding the breath to increase lung capacity, but Embryonic breathing is actually a bit different. Embryonic breathing means that your breath feels like an effortless, internal movement. Your breathing becomes so natural you are not aware that you are the one breathing, like a new-formed child in the womb. When I practice this type of breathing, I find that my spirit and breathing become aligned, I become less aware of myself sitting there. I become present in the moment, and am only aware of the breath. This is a very useful type of breathing for meditation. Focusing the mind too sharply on your breathing can prevent the naturalness of breath needed for Embryonic breathing, so instead of diligently practicing this technique, I find it more useful to let it happen naturally. If you use one hand to hold a feather under your nose while practicing this type of breathing, it will not move, your breathing is so calm and subtle. Embryonic breathing is also called nei hu xi (内呼吸 meaning 'internal breathing'). Soldiers in China, singers, and external martial artists often practice chest breathing. This involves breathing practices that expand and contract the chest and ribs, and develops the strength of the upper lungs. The practice of yelling or exhaling qi through the mouth when practicing martial arts also practices the qi of the lungs. However, these types of breathing are not a part of typical Daoist or internal martial art practice. The Daoist conception of the body tells us that the qi (气) or "intrinsic energy" in the body naturally moves upward. We believe that practicing chest breathing encourages this tendency. When the qi in the body is raised, it is best to do the jumps and flips that are common in the external arts. However, if the qi in the body is high, a person will also feel unsettled, like a tiger in a cage, they will have a bad temper. In the internal arts the qi of the chest is compared to fire and a tiger. The qi of the stomach is compared to water, or a dragon. Our traditional Daoist practices involve grounding the qi low within the body instead of raising it. When the energy of the chest and the energy of the belly are able to mix, this is called 'mixing fire and water'. As everyone knows, when fire and water are mixed, they create steam. This steam (qi) creates more energy for the body. This type of metaphor is common in the Daoist internal arts practices, where the body is compared to a crucible (stove for making medicine) where fire and water create steam (more qi for the body). The role of the mouth in the internal arts related both to Confucian and Daoist theory. Confucian thought teaches that the mouth is the source of many problems. We have a traditional saying (祸从口出，病从口入) meaning that "trouble exits from the mouth, and sickness enters." This refers to the problems that saying the wrong thing, or eating and drinking unhealthy things can cause. However, the mouth is also necessary for preserving life. Ideally, it should be used for nourishing qi. This means when we eat and drink, we should do so in a way that brings energy to the body. Daoism teaches that talking too much can exhaust the body's energy and vitality. This is why all religions have a practice where people take vows of silence. When I first leaned these techniques, I tried them out by walking around the outside walls of the temple with my mouth wide open. I found that I got tired a lot easier. This is something you can try out for yourself. Preventing excess energy from exiting the mouth spans the Daoist meditation and martial practices. For this reason, I was taught that it is bad to expel breath through the mouth while practicing. The reason for this is because the energy and breath in the body should be conserved. If too much qi is exiting from the mouth, it will weaken your punches, and you will tire more quickly. Also, if you are making loud noises while practicing, it is easy to become self-conscious about what noises you are making, and how loud they are. How many people have found themselves embarrassed because they are making more noise than the people around them. When this happens, your mind is drawn away from where it should be. It is said that in the internal martial arts, we use qi when we practice. It is important to remember that qi does not just mean 'breath'. Rather qi refers to the material energy of the universe. It is the air we breathe, and the food we eat. It is also given to us from our parents before birth, and taken in during our interactions with people. Qi refers to anything intangible but perceptible, things you can feel easier than see. However, while it is easy to think of Qi as an energetic substance, it is also correct to think of it as a process. In Chinese medicine, Qi is most commonly defined not by what it is, but by what it does. This is similar to the conception of energy in modern physics, where matter is describes as having an interconnected physical and energetic qualities. Qi is that which warms, raises, and harmonizes, as well as the process by which things are warmed, raised up, and harmonized. This material energy works in many ways, creating movement, and nourishing the body. Nourishing your body's qi can be done by practicing breathing techniques and meditation, eating and drinking nutritious foods, keeping your interpersonal relationships healthy, and working to create a clean environment. When a martial artist uses qi it also refers to a process. For me, this process begins by keeping the breath in the body low, and emitting force through the entire body. When I practice, I breathe deeply into the abdomen, and fill the dantian. When I emit force (发力 fa li), I am breathing out from the dantian, through the nose (which lets air out slower than the mouth, hence avoiding letting out too much qi). While the mouth exists mainly for the intake of nutrients, the nose was designed to be the main organ of respiration. The dantian is also kept full on the exhale, and my mind (忆 yi) is focused on using the qi and strength from my lower body and waist. In this way, whole body movements are used. This means using the legs, dantian, and waist area to emit force, and keeping the mind focused on where the force is going. The mind, breathing, and body are all in harmony. When the body and mind are synchronized, the qi of the body will harmonize with your movements naturally.